We met Major Juanita Chang, the Director of the Online and Social Media division office of the Chief of Public Affairs, Dale Sweetnam, SSG, and the rest of her team. 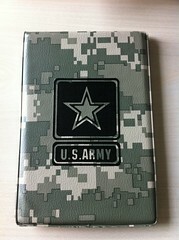 Major Chang made me laugh when she asked me to write down the list of things she was concerned with by handing me a notebook with the U.S. Army on it. I told her if we can’t support our troops fighting for our freedom who should we support? ;) We had some interesting conversations and tried to help her team use Twitter (where Matt works) and Flickr (where I am working). 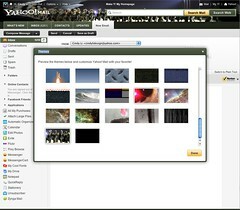 The Army has an account on flickr and it’s quite active. SSG Sweetnam is in charge of that. I worked on the Yahoo! Mail project previously and thought it would be great with their permission of course to create a few Yahoo! 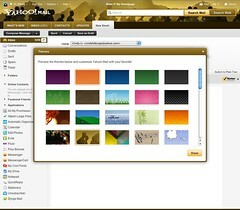 Mail themes to promote our troops. I searched through the photostream and had a few to retouch because of the background would repeat. I tried to find photos that would represent the best of our Army troops and would also work in a horizontal crop. 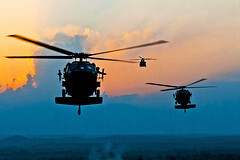 This photo is a photo of troops running in the morning. I loved the color and light. 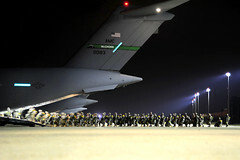 The photo is of the Airborne division boarding for a jump. The photo contain two helicopters in the sky. It was a bit tricky because when it’s cropped the helicopter on the left looked like it had blown something else so I used the right helicopter. How to get your very own Army.mil theme! Sign in to your Yahoo! Mail account and go to the Yahoo! 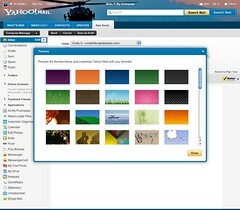 Mail themes page.